Stomach cancer in cats is often a silent killer because a cat shows very general symptoms that make it difficult to diagnose. Learning the signs to watch for might just save your cat's life one day. Diagnosing a case of feline stomach cancer can be undertaken in several ways. First, your vet will listen to your account of the symptoms your cat has been suffering. Based on this information, he/she will perform one or more of the following procedures. An abdominal ultrasound or radiograph may be all that is required to reveal abnormalities in the organ. However, confirming a case of cancer usually requires closer examination. Your vet will typically want to run a blood panel to search for elevated white blood count levels and other abnormalities. A gastroscopy may be called for, and involves putting the animal under anesthesia and passing an endoscope down into the stomach to view the interior and gather a sample of suspicious cells for biopsy. Finally, exploratory surgery is generally the most effective means of revealing, and, if possible, removing malignant cells and masses. Stomach cancer is a very secretive disease in cats. The symptoms start out barely noticeable, and they gradually increase until your cat is uncomfortable enough to quit hiding how he feels. Thankfully, the rate of stomach cancer cases is comparatively low to other types of cancer found in cats. 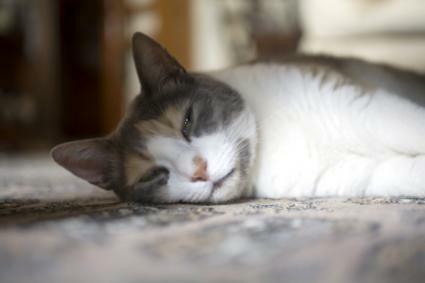 There are several types of stomach cancer found in felines, some more common than others. Let's take a closer look. Adenocarcinoma: This form of cancer originates in glandular tissues and finds its way to organs such as the stomach, small intestines and large colon. Once there, the cells multiply into gastric tumors. Lymphoma: This type of cancer is typically caused when an adenocarcinoma metastasizes to the lymph nodes. Mast cell tumors: Mast cells are naturally found in the linings of the digestive tract, and they play an important role in immune system functions. However, sometimes these cells unexpectedly form clusters/tumors and begin to behave abnormally. They release large amounts of chemicals into the cat's body that do widespread damage like causing stomach and intestinal ulcers. Neither chemotherapy is a good option for treating feline stomach cancer. Radiation is not considered a good option because the radiation may damage the other organs that are nearby. Chemotherapy hasn't been proven effective with this type of cancer. Therefore, surgery is typically the best option for treatment. In most cases of feline stomach cancer, surgery is the most effective treatment. Before surgery, your cat will be brought to the veterinary hospital and stabilized with IV fluids to offset any dehydration caused by vomiting and low food/water intake. 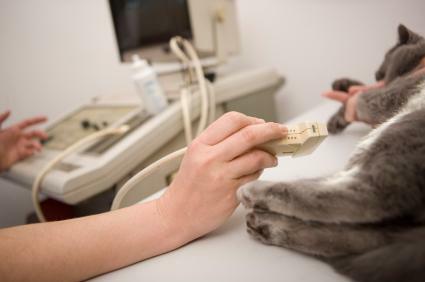 Your cat's temperature will be monitored, and IV antibiotics may also be administered if warranted. During surgery, the unhealthy tissue will be excised from the stomach and any surrounding tissue/organs that may have been affected. After surgery, your cat will remain on an IV and spend approximately 24 hours recovering at the clinic. After the first 12 hours, your cat will be offered a liquid feeding mainly consisting of broth. Soft food may be introduced after 24 hours, depending on the extent of the tissue removal. 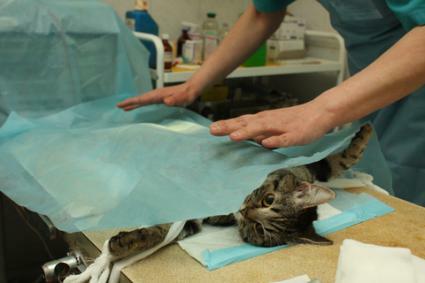 After that, if your cat's vital signs are good and there's no sign of a post-surgical infection, you'll be given specific care instructions and allowed to take your cat home to continue the recovery process. The vet will also want to schedule a follow up visit to assess how the healing is going. It should be noted that the main challenge in treating stomach cancer in cats lies in the fact that by the time the cancer has been detected, it has often spread into the nearby lymph nodes. From there, the cancerous cell are circulated throughout the body, often taking root in other places. Lymphoma is actually very treatable in cats, but other cancers are more difficult to treat successfully. It's common for cancer to reappear months or even years after a successful treatment. For this reason, most cats that survive cancer surgery are only given a guarded, fair prognosis. In many cases, surgical intervention results in an additional 12-14 months of life for an affected feline.